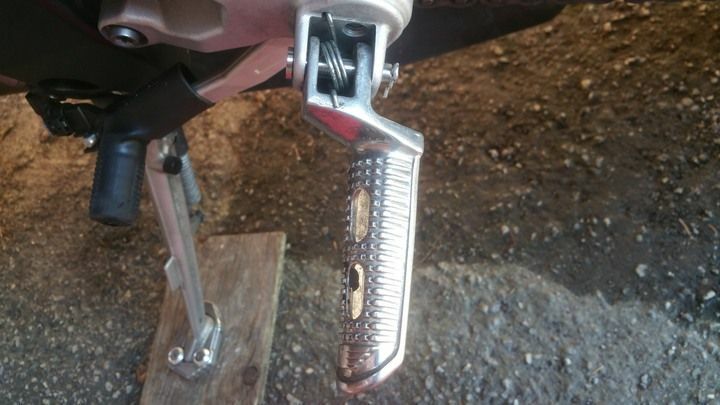 I have mentioned the Buell peg mod for all those who suffer from hip and knee pain with the stock footpegs. Recently I drilled out the stock footpeg post with a 1/16th bit and drilled a small hole to allow for a cotter pin for easy swap back to stock for track days. If you dont have access to drill press, take the stock peg off and take it to any machine shop and drill out a 1/16th hole in the band where the circlip lies and add a small cotter clip. 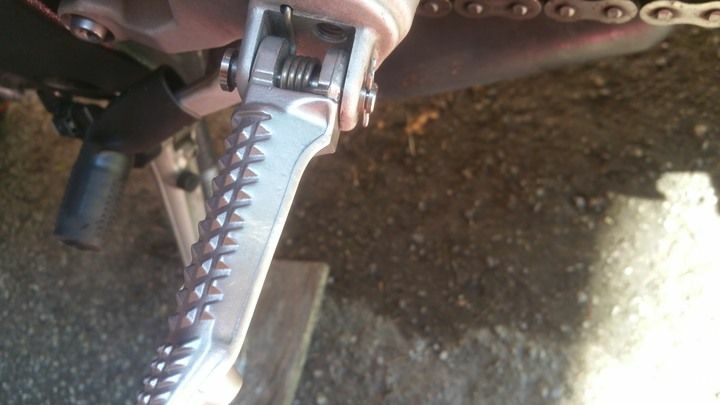 Here is shot of the clip on the buell pegs. Swapping back and forth is 1 minute a side. Where did you get the parts? How much did this mod cost? I didn't understand what you did but thanks for sharing. I used the stock BMW pin which I drilled out. The buell lower pegs come with new springs. I understood what you did, but perhaps a better photo angle of the Buell peg might show how much lower/offset that peg is compared to stock. You might also want to put a diagram of modification required to the stock peg and a parts list to really make it simple. I think you meant the drilling the cotter pin bolt and not the peg itself. 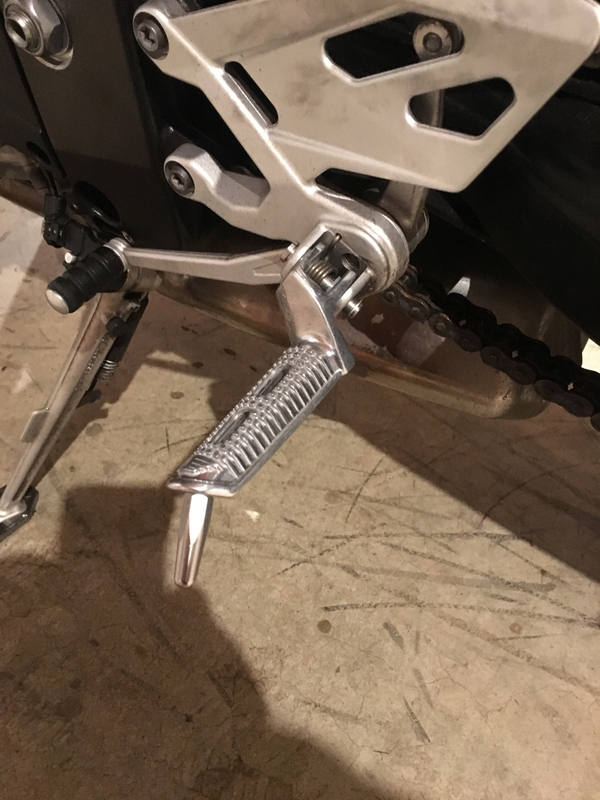 Just received the buell jpegs and have a question about the installation. I took the stock pegs off and the pin is loose without the shaft support. I was planning on drilling it out slightly for support and use the rest off the stock hardware. Am I over thinking this? I am not planning on switching back to stock pegs. I just did this mod yesterday. My pegs didn't come with new springs so I re-used the BMW ones. I used some nylon spacers to adapt the stock pin to the modified Buell pegs. A few inches of snow on the ground so I haven't had a chance to try them out. If I'm not happy with them I can switch back in minutes to the stock parts and I'm only out about $40 and an hour of my time. I used hard nylon spacers to adapt the 8mm pin (close enough to 5/16") to 1/2" on the Buell pegs (drilled out from 7/16"). I couldn't find spacers that went from 5/16" to 7/16" and wanted something a bit more substantial anyway. At some point I might take the spacers in to my local machine shop to replicate in aluminum but will see how they work first.